Will you be getting a slice of the Frenzic pie? As Advent draws near, it's truly the season of giving, with Nintendo joining in the festive spirit by giving Nintendo download fans 50% price cuts on two WiiWare titles finally making their way across from North America. Elsewhere, fans of NES side-scrolling RPGs are well catered for, and DSiWare gets the week's only genuinely new releases. Blood Beach (Coresoft, 500pts) – This beach head shooter has received a price drop since its North American release, but even at 500 Points it's hard to recommend. Our Blood Beach review takes no prisoners. Flowerworks: Follie's Adventure (Nocturnal Entertainment, 500pts) – Another game down in price compared to its transatlantic brethren, Flowerworks is a fun combination of gardening and fireworks, as odd as that sounds. Our Flowerworks review thought this was worth 1000 Points, so at half the price it's a steal. Robox – A free sample of the full game to see whether you're more a fan of Dreambox Games' latest work than we were. Our Robox review might help you come to a purchasing decision too. Need for Speed Nitro-X (EA Games, 800pts) – EA's flagship racing franchise comes to DSiWare in a bite-sized portion, but it's still got a fairly full features list. It's worth taking this one for a spin, as you can read about in our Need for Speed Nitro-X review. DodoGo! Challenge (Neko Entertainment, 500pts) – A follow-on to Neko's enjoyable DodoGo!, this one looks set to offer more endangered egg action in over 100 levels. We'll have a review shortly after release, but in the meantime tide yourself over with our DodoGo! review. Music On: Electric Guitar (Abylight, 200pts) – The newest entry in Abylight's musical series, as you'd expect this focuses on the world's most popular six-stringed instrument with a distinctly rock feel. Released in North America earlier this week, our reviewer is strumming away and we'll have a melodic resolution for you soon. Frenzic (Two Tribes, 200pts) – DSiWare might be swarming with puzzle games, but Frenzic comes in at the right price and with a decent pedigree, so could be worth a look. You can read our Frenzic interview for more information on how this game came to DSiWare, and keep your eyes peeled for our review next week. 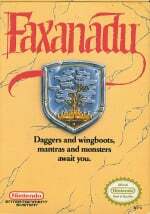 Faxanadu (NES, 500pts) – Outed in an earlier Virtual Console release list, Faxanadu is a side-scrolling action RPG not unlike Zelda II: The Adventure of Link. As the game's hero, you must climb up the massive World Tree, defeating the hideous monsters that have infested it, in order to protect the many villages you'll find. It's a charming little title, and one we'll give a thorough once-over once again after release. Now it's your favourite time: press release time. Breathe it in. Get ready for action with this week’s offerings from the Wii Shop Channel and Nintendo DSi Shop. Flowerworks®: Follie's Adventure challenges players to transform the world from drab to fab while Blood Beach sees you fighting for your very existence available to download this week on WiiWare. Robox® Demo* (DreamBox Games) is a WiiWare demo launching this week which sees players crashing-landing on a strange planet, where they must unveil the truth behind their intergalactic mission. Available for download from the Nintendo DSi Shop, DodoGo! Challenge offers players all-new challenges in the mission to save this dozy bird from extinction. Need for SpeedTM Nitro-X will satisfy the speed demons amongst you, while for those wanting to test their brain as well as their fingers, Frenzic offers hours of puzzling fun. As for budding Rock Gods, Music on: Electric Guitar enables you to transform your Nintendo DSi into a pocket electric guitar! The latest addition to Virtual Console sees the arrival of RPG classic, Faxanadu which will transport players to its fantasy Elven world. An enhanced version of the 'Flowerworks', Flowerworks: Follie's Adventure is a meaty adventure game offering both single and two-player co-operative play and all new features such as, new Beginner & Mastery difficulty levels, in-game support for four languages (English, French, Spanish & German) and many more surprises. In Flowerworks: Follie's Adventure the heroine, Follie, is transporting a cargo of mystical Flowerworks seeds intended for Follie’s aunt, when her ship is pulled off course and crash-lands in a particularly dull area of the planet Elilia. Your mission is to explore the planet with Follie and help her recover the seeds to transform the world from drab to fab! Beware though as you'll encounter strange inhabitants along the way, some of whom will help Follie in her quest and some who will hinder, such as naughty garden gnomes. Offering players a fun-filled exploration mission amongst a stunning scenery of blooming flowers and colourful fireworks, Flowerworks: Follie's Adventure includes Adventure, FreePlay and Tutorial game modes, five difficulty settings and a 20 hour epic adventure. Just a thin stretch of "Blood Beach" stands between you and the whole of the Japanese Imperial Navy. Hopelessly outnumbered, your only chance of survival is to fight...and win. While you command an impressive arsenal, including the M2 BMG, 40mm M1 and, of course, your Thompson SMG, the Imperial Japanese Navy will retaliate with every weapon at their disposal, from “Zeros” to “Bettys”, even Takao-class battleships, in their relentless mission to recapture the Solomon Islands. Do you have what it takes to win? Get in gear for the super-charged thrill of driving the world’s hottest cars in this adrenaline-fuelled, arcade-style racing game. With Nintendo DSi-driven touch controls, which give you the feel of real racing and up to 18 supercars to put through their paces, you can spend hours of fun satisfying your need for speed in this action-packed game. You can even set your siren off in the exclusive Super Pursuit Mode that lets you drive as the Cop! For those who fancy battling it out with their mates, a four-player mode will have you vying to see who of you is a speed demon and who is a speed geek! And as if that wasn’t enough, with custom features like the Camera Tag Editor, you can snap images with the built-in camera and plaster racing environments with your personal tag. Danger still lurks on Domo Island in this brand new instalment of DodoGo! Challenge. Offering all-new challenges, hours more gameplay and more combinations to save (or break!) the precious eggs, your mission is to take up tools once again and attempt to lead the last remaining Dodo eggs to safety. A touch-based game suitable for players of all ages, DodoGo! Challenge is full of surprises and bonus levels. And with over 100 “attractive” missions to complete, it’s one small step for Dodo, one giant leap up the world rankings on the official website! 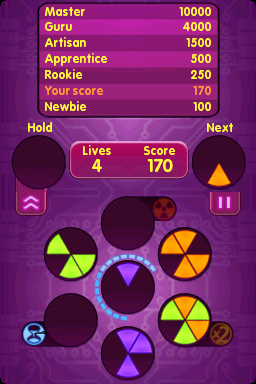 Frenzic is a unique puzzle game that will stun the senses, as well as tease the brain and will keep players coming back for more! A game that takes just minutes to learn, you may find your initial feeling of triumph to have been a little premature and soon discover Frenzic takes months to master as you devise new, impressive gameplay strategies which test your brain to its limit. Suitable for puzzle enthusiasts of all ages, players can spend hours of fun competing against their personal bests, as well as advancing through six levels of Devotion, from Newbie all the way to Frenzic Master. They say good things come in small packages and now with Music on: Electric Guitar you can create your very own pocket Electric Guitar. Transform your Nintendo DSi into an incredible electric guitar and your stylus into a pick to play your favourite songs, wherever you are. With unbelievably realistic sounds, a 950+ chord catalogue that you can both see and hear, players can also utilise three pedal effects: Distortion, Flanger & Delay, plus take advantage of a special screen for melodies as well as 32, chord short- cuts. Rock on! Originally released in 1986 and now re-released on Virtual Console, this popular action RPG brings a unique outlook to the world of classic fantasy. In Faxanadu, you adopt the role of an adventurer who has just returned to his home, the Elf town of Eolis, at the base of the World Tree. You return only to find your village in peril - the Elven water supply has dried up, monsters are causing chaos and the Tree itself, which once stood proud, is slowly wilting. Equipped with the last of the King's money and the trust of the people, you set out to climb the World Tree, braving obstacles, fiends and dangers to discover the source of this corruption. Wield weapons and magic, get hints from townsfolk and experience a world of new environments as you ascend to the top of the world! The portal also provides step-by-step tutorials explaining how to connect the Wii console to the Internet and how to download WiiWare games, as well as a video showing how to use Nintendo Points. Visit wiiware.co.uk for all the details. 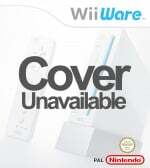 Downloaded games can be saved to Wii's internal memory or SD card and added to the console's Wii Menu or SD Card Menu for anytime easy access. WiiWare demos offer players the ability to trial select WiiWare games without using up any of their Wii Points, giving players the enjoyment of testing out the game before ultimately deciding whether to download the full version of the game or not. WiiWare demos are currently available for download via a dedicated list on wiiware.nintendo.co.uk as well as on the Wii Shop Channel itself. I'd get Faxanadu, but I haven't enough golds. Faxanadu. Period. I hope this is a good sign we will get it over here SOONER than LATER, I'm dying to pick up where I left off with this game. Nice, a Robox demo. I hope they continue the weekly demos, it's great. Glad we get a Robox demo. The game was on my wishlist, but the review put me off. So the demo might get me interested again. Otherwise nothing for me. Still no clue about Flowerworks. Another game that could really use a demo. No Cave Story equals no Download for me, the US have had it for almost 9 months now and still we have not got it! Demo is rubbish this week 2. Anybody know if Faxanadu still plays well in 50 hz? Thanks for the discount on Flowerworks and Blood Beach, Nintendo. I saw the trailer for Music On: Electric Guitar and then bought it (Finding out it actually did come to America on Monday), and it sounds so absolutely sick and awesome it even beats $600 guitar samples that I've found on the internet. It fortunately has really good controls too. Easily the best Music On released yet. @Mickey: At least in the original cartridge, the music plays fine, if thats what you meant by "playing well". And to everyone else who liked side-scrolling action RPG's: Get Faxanadu now! Its excellent in terms of challenge, gameplay and visuals. I love weekly demos, it gives me something to look forward to in every weeks download thats free! Thanks a lot for giving us Blood Beach for half the price. It's like christmas and birthday all in one. The nice thing about having Faxanadu on the VC is we won't have to mess with those crazy passwords! Aww where's Tetris Party Live! Some good games this week but nothing for me. Why is cave story taking so long? It's taking longer than lit did. I only wish new DL songs in Just Dance 2. @Scottie - I've played Cave Story on Wiiware, and Faxanadu is a much better game. So by my count, the most interesting part of this batch is that Faxanadu, an NES spinoff game of Nihon Falcom's Xanadu/Dragon Slayer series, which was developed by Hudson Soft and published (in NA, at least) by Nintendo, indeed seems to be back in the hands of Nihon Falcom. This might portend us getting to enjoyably wander around aimlessly to some excellent Yuzo Koshiro music in the Namco-ported, Broderbund-published NES version of Nihon Falcom's fellow metroidvania Legacy of the Wizard (which is from the same general series) for 500 points. I'd buy it! Maybe I'd even get somewhere in the game this time! No Cave Story, no buy. May I interest you in a free download CMM? Nice, Europe got Dodogo! Challenge. Lucky you. Bass X0 can interest ME in a free download. Yay Flowerworks! I think there's changes been made for the PAL release, though I cannot recall what (have to dig through mails from the dev). I'm also waiting eagerly for Cave Story, but with Flowerworks, Flingsmash, the new Tron game coming tomorrow and Dive/Blaster Master unfinished I've got enough to get on with at the moment! I didn't like the Robox demo. From the demo alone, I think 5/10 is too high. 4/10 would be more appropriate. Its bland. Its dull. It doesn't even look that good. Although there are worse games. Maybe it gets better later on but I certainly wouldn't buy it based on the demo alone. Robox is a pretty good game. The graphics are beautiful with a very nice parallax effect and there are no framerate issues like in other WiiWare releases. What I saw in the demo is pretty varied. There are "point and shoot" sections, the puzzle gameplay in the interior of the robot and of course the game itself, it's much like Metroid. What annoys me (judging from the demo) is the very slow pace of the movement inside the robot. And the extremely dull music. And most of all: The lack of a map. The lack of a map is the most terrible thing in this game. But I think it's still recommendable if you have a good sense of orientation. If Dreambox Games make Robox 2 someday then PLEASE ADD A MAP!!! @argus - Are you sure? We have waited for Cave Story for a long time and we need this game before Xmas please. I don't know who's fault it is but just release it - Friday 3rd or 10th Dec will do (probably the later as there are some big releases already on the Wii next Friday).